Please follow the instructions below. If you have any issues whatsoever, please contact support@nodesupply.com or join our Telegram group. Retrieve this from the 'My Nodes' page or on your subscription page on nodesupply.com. 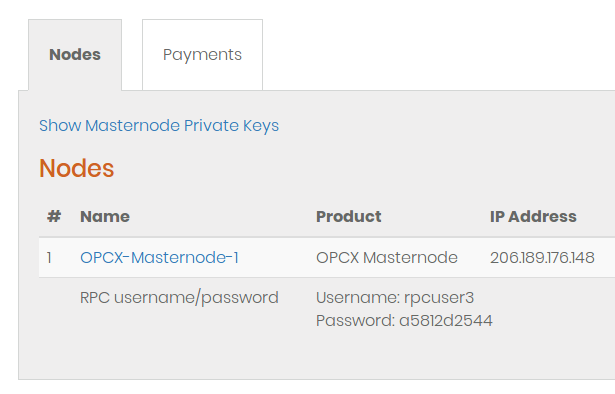 This is the masternode private key you entered when ordering your masternode, the result of 'masternode genkey'. This is a long string that looks similar to 5J55yHcyTiqq81WEzvHi7SKN37ZhqhZWUbog7NRzNkmQuVMd2Z4. This is the long string of characters of the output from the 'masternode outputs' command. This is either 0, 1 or 2. This is retrieved from the second part of the 'masternode outputs' command. You can find this on your 'My Nodes' page or on your subscription page. Make sure to reboot your wallet, so the masternodes tab appears. Go to Tools > Debug Console, and type in 'masternode start-alias YOUR_MN_ALIAS'. Please replace YOUR_MN_ALIAS with the masternode alias that you entered in your masternode.conf (the first word of the line in masternode.conf). After a few minutes, your masternode status should be 'active' on your subscription page, and your wallet should say ENABLED on the masternodes tab.